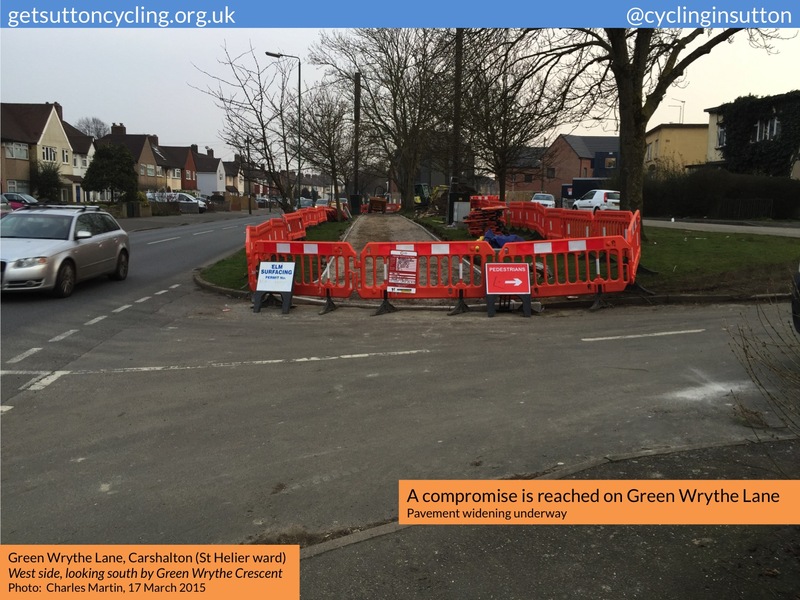 Further to our 22 January 2015 update on the Green Wrythe Lane footway cycleway we now understand, from the minutes of the Sutton Council meeting held on 19 January 2015 and from correspondence received from Transport for London in early March 2015, that a compromise position has been reached. Draft minutes of January’s full Council meeting were published online on, or around, the 20 February 2015. The minutes included the reply given by Councillor Jill Whitehead to a supplementary question that had been asked by Councillor Neil Garratt in relation to the Green Wrythe Lane cycle scheme. (Neil’s primary question, and both of his follow-up supplementary questions, are reproduced below). From Jill’s reply to the supplementary question we learn that the scheme is to go ahead in its present form without any changes. However, it will be a pedestrian scheme and will not be described as part of Sutton’s cycle network. In her reply, Councillor Whitehead notes that Transport for London had put on hold the Green Wrythe Lane scheme, following objections from Get Sutton Cycling, to enable the suitability of the scheme to be assessed. Brian Deegan, Principle Technical Planner at Transport for London, and a lead developer of the London Cycling Design Standards, had subsequently visited the site. Brian had “appreciated the site constraints and the need of a safe scheme taking into account the number of local schools in the area”. Furthermore, he “fully supported the proposals in their present form without any changes”. Jill adds “The Cycling Commissioner [Andrew Gilligan] has agreed that the scheme can progress. However, he has requested that it is rebadged as a pedestrian scheme. Cyclists will be able to use the new build out footways and it will be promoted as a safe route to schools in the area for walkers and cyclists”. Correspondence subsequently received from TfL, on 6 March 2015, confirmed that, following high-level discussion between the Cycling Commissioner and the Lead Member for Transport at Sutton [Councillor Jill Whitehead], a compromise position had been reached “whereby a scheme for Green Wrythe Lane will go ahead that will be promoted as a local safe cycling route rather than as a part of Sutton’s cycle network”. 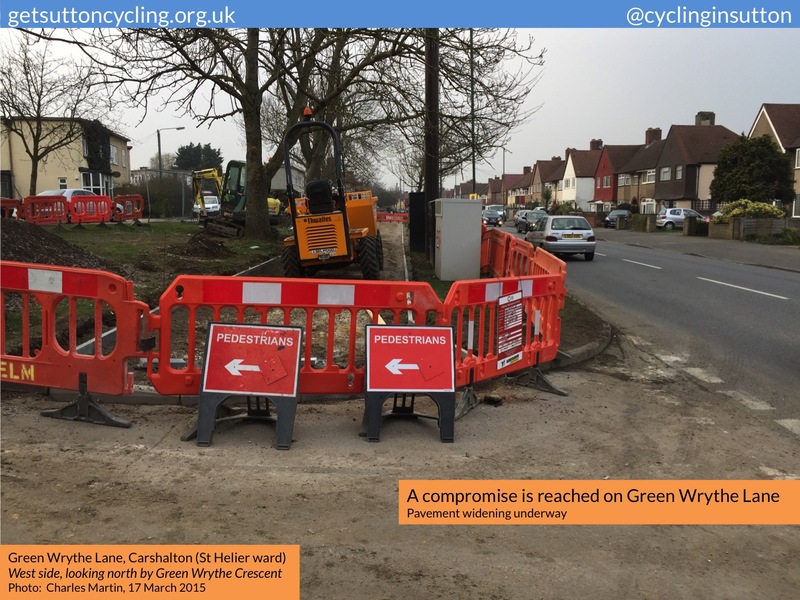 Work commenced on the Green Wrythe Lane scheme during the week beginning Monday, 9 March 2015 – the same week that saw construction start on the north-south cycle superhighway in central London. The decision to proceed with this “compromise” is rather disheartening, but not surprising. Clearly, we have a long way to go in Sutton to make the case for cycling. But perhaps this Green Wrythe Lane scheme will signal the end to proposals to convert pavements in the borough to ‘footway cycleways”. Perhaps the forthcoming Cycling Strategy for Sutton, expected in draft form by the end of April 2015, will be a driver for change. In the meantime, let’s hope that residents of Green Wrythe Lane like their new footway when it is finished. Let’s hope that those who cycle on it will do so with care and consideration for other users. The full document Appendix B – Amended, item 36 is available here. To ask the relevant lead member, is the proposed shared footpath and cycle way on Green Wrythe Lane an example of good cycling infrastructure? Bearing in mind the new Sustainable Transport Strategy, is this indicative of the standard of cycling facility that this Council intends to adopt across the borough’s cycle network? The design chosen for the cycle route along Green Wrythe lane is considered the best practical option for that particular road, taking into account the narrow carriageway width, parking, trees, and the slope of the verge, which could make widening the road or providing a segregated cycle track costly and difficult. In other areas, where space allows, we will be more ambitious, providing cycle routes with greater priority with wider segregated lanes. Future schemes will also be designed in accordance with the new London Cycle Design Standards, in close consultation with local cycling groups and TfL, and in anticipation of an increase in cycling rates. In addition to the new Sustainable Transport Strategy, the council will be commissioning a new Cycling Strategy for the borough which will set out in more detail our approach to cycling and scheme design. The full document Appendix D – Amended, item 36 is available here. Further to the reply given by Cllr Stears to my question on 19th January, I welcome the news that future cycle schemes in Sutton will meet the new London Cycling Design Standards (LCDS). Could I ask the appropriate lead member to confirm that all future road schemes in Sutton will follow the new LCDS? In order to ensure that these design standards are being followed, could I ask that future reports to committees which propose schemes, will include a statement confirming that the proposal meets the LCDS? The London Cycling Design Standards are for guidance and will be used in the design of schemes as appropriate. In some situations it will not be possible to apply the recommendations in the guidance because of site constraints. Schemes which have involved cycle facilities in the past have been in accordance with the LCDS guidance and this will continue with the updated LCDS as appropriate. There are numerous standards, guidance and regulations which are considered and used in the design of road schemes – Manual for Streets, Accessible Bus Stop Design Guidance, DfT Traffic Advisory Leaflets, Design Standards for Signal Schemes and the Traffic Signs Regulations and General Directions to name but a few. Whilst the LCDS might be appropriate for highway schemes involving cycling facilities, they might not be appropriate for all schemes. We therefore do not intend to include a statement confirming that proposals meet the LCDS in future committee reports, as more appropriate guidance might have been used for that particular site. In his written reply to my question carried over from Council on Monday 19th, Cllr Stears stated that the proposed Green Wrythe Lane cycle scheme is the best practical option for the site. Could I ask the appropriate lead member, if this design is the best practical option, why was it put on hold at the last minute by transport for London, pending a review by TfL’s own designers? This extraordinary turn of events suggests that TfL disagrees, and that something better can be achieved. Further, the Sutton branch of the London Cycling Campaign has publicly stated that they consider this scheme to be such low quality that they would rather it did not go ahead at all, as the money could be better spent elsewhere. As a cyclist, I am inclined to agree. How did such a poor quality scheme come to be proposed and accepted by both officers and members at Sutton Council? Transport for London put on hold the Green Wrythe Lane scheme following objections to the scheme from Get Sutton Cycling to the Cycling Commissioner. Works were about to start on site, therefore, TfL asked if the scheme could be put on hold until the suitability of the scheme could be assessed. Brian Deegan from TfL, who drafted the London Cycle Design Standards, reviewed the scheme following a site visit with officers. He appreciated the site constraints and the need for a safety scheme taking into account the number of local schools in the areas. He fully supported the proposals in their present form without any changes. The Cycling Commissioner has agreed that the scheme can progress. However, he has requested that it is rebadged as a pedestrian scheme. Cyclists will be able to use the new built out footways and it will be promoted as a safe route to schools in the area for walkers and cyclists. It will not be described as part of Sutton’s cycle network. 7 April 2017: The last word on Green Wrythe Lane?